During the Q and A portion of the conference, NAI seniors had the opportunity to actively participate; they offered takeaways, connected the presentations to their own learning, and asked follow-up questions. 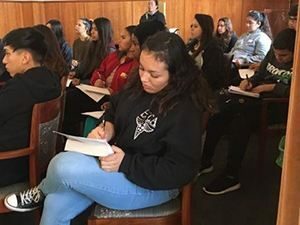 UCLA mentors graciously responded to NAI students’ desires to participate in the discourse and directly engaged with the insight offered. As a result, our students became energized by Middlemarch. On the bus ride home, the conversation was extended as students discussed their experiences with their particular mentors, and how impressed they were that their presentations weren’t even considered “completed papers” (She looked like she had ten pages!). They recalled one student’s reference to the novel as a “lab report,” weighed in on the sexuality of Bulstrode (a hot topic that made Bulstrode interesting all of a sudden), and identified the Ariadne statue featured on another student’s essay as a potential image to add to the “Rome scene” in our play. All in all it was a wonderful morning to see the fruition of a multi-generational community of acquired knowledge! Something that was interesting and that caught my attention was the presentation “To Hear with Eyes” from Paige Dudek. She took a step outside of the literature world and rather went into a more psychological perspective. She talked about her experience as a teacher of young students learning how to read, and she mentioned how she noticed that the students always read out loud and never quietly, in their head. She mentioned that even when they were told to read quietly, the students would still mumble and whisper while reading out loud. She related this to a broader spectrum of our capabilities to stay focused and the most effective ways, especially when reading a novel like MiddleMarch. She mentioned that we require most of our senses in order to stay focused, that include hearing, seeing, and touch even. 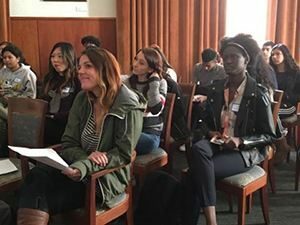 During our conference at UCLA the various unique topic discussed , from gender relations to fantasy many of our character in middlemarch felt ,were very interesting and shocking. One in particular that had me analyze middlemarch a whole different way which was Ashley Hope’s “turn to stone :the romance of eternal retrospect”. This prestentaion was wonder first of all as the main point argued was for us to become remembered we have to place ourselves in other position to be remembered by our consideration. Hopes slide showed us the aspect of how Rome , stone , and eternity resemble the same thing, to become preserved in time. She explained how Rome the city of the ancients has been known for its various figures that have been stopped in time due to stone. Through stone we are able to become remember figuratively by our action such as Dorothea’s action of sympathy throughout the book. The transition our characters face as each one of them start the realize the importance of Rome and how each one of them discovered their callings. Stone I believe is the most important aspect of Hopes presentation as two lovers will be remembered as their memories are turned to stone. After attending the UCLA conference “A Study in the lives of Middlemarch” I gained new knowledge on the novel Middlemarch.Aissatou Thiombane’s presentation “Sexualits and the Dual Representation of Erotics” caught my attention the most. Her argument was that Raffles and Bulstrode had sexual relations in the past. While reading Middlemarch, my minor character was Bulstrode, we had to analyze his desires,fears and turning points. One big desire that he had was Raffle’s death. After hearing Aissatou’s argument, a lot started to make sense and add up to why he wanted Raffles to die. Though it might not be true, it makes sense that Bulstrode’s relationship with Raffles was a burden on him and he didn’t want anyone to find out. After hearing this, I also belive that because of Bulstrode’s religious background, this gossip about him and Raffles would affect him tremendously since this is frowned upon by the church. Every single detail about those too started to make everything have a clearer picture and backed up Bulstrode’s desire of Raffles death. Another argument thathat caught my attention was Emily Chen’s. She made a good point on how Dorothea’s motive to have a need of helping others and putting herself in their shoes. This report shined a new light on aspects of different characters that I had not considered before. The report is about the notion that John Raffles and Mr. Bulstrode might have had homosexual relationships in the past and Mr. Bulstrode is a tightly religious man because of his “sin”. Mr. Bulstrode’s heavy devotion to do actions for the “glory of god” are backed by shallow reasoning, like he just happens to be a good samaritan but the points brought up in this paper make me think that Bulstrode is devoted due to him repenting for his previous sins including homosexuality. Later in the book when Bulstrode kills Raffles the initial thought is because Raffles knew many bad things about him but his action of murder could also be a self justification to purify himself of his own sins, almost become a self-sculptured image of God himself to feel in power and correct. Those are just the thoughts that I had about the paper but I really enjoyed it as well as all the other papers that we listened to. First of all thank you UCLA students you’ve helped me understand different types of ways to see the book Middlemarch. what spoke out to me in “James Chettam and masochistic Guilt” was that dorothea was always that normal, average type but what was special was she was more in controll than the rest and that some people should be treated like a queen. Another example like in Paige Dudek,”To Hear with Eyes” caught my attention because in Dorothea’s mind she was constantly thinking about what other people were thinking about a situation or if they were judging a person. I believe Eliot wanted us see if our own perspectives are different from everyone else.Erin Hayes “Paradigm shifts and Science:Redefining the Nature of Lydgates Plot” also caught my attention because I had a question that would relate to the book. My question is if the narrator might be a scientist? Or she is? Because in the novel Eliot talks about chemicals, The Peir glass and more. Eliot always had a method to expand your reading to think outside the box and give a deeper meaning to the text. Another question would be if she had a purpose to use science in the Novel? Throughout the middle march conference, something I really enjoyed was when one of the students talked about that a person can break a social norm. Also another thought is in a the paper Sir James wishes Dorothea is a queen and it is not possible for her to be a queen, it is never in Dorothea power to wish she was a queen.Dorothea is a preventable character want her to be powerful.After hearing that I was still wondering why is Dorothea a preventable character?is she scared of what society may think of her?I also enjoyed the paper on Turn to stone:The Romance of eternal retrospect.Rome is a place of memory as the reader said .why did the author George Eliot pick Rome as the place for Will and dorothea relationship to start?She also mentioned what the encounter in the present,understanding the past by what’s happening in the present. In Paige Dudek’s presentation “To Hear With Eyes”, one thing I noticed was how important visual and auditory senses are when understanding a text. This was made clear through her chart, describing different ways of reading include different senses. Paige also used this quote, “The volume was Ivanhoe, and Jim was in the great archery scene at the tournament, but suffered much interruption from Ben, who had fetched his own old bow and arrows and was making himself dreadfully disagreeable, Letty thought” and you can see that while Jim is reading out loud, Ben is not using any text imagery but instead using his own imagination. She also mentioned how when children learn to read, they always have to speak the text out loud. Meeting her and knowing more about Middlemarch in depth was a great experience. I had not thought of this topic in Middlemarch before but now I am interested to know more. During the UCLA Senior Socratic Class Seminar I found Erin Hayes presentation really interesting and intense. Erin Hayes goes on to talk about and idea that “science leads to everything.”Science in this novel is seen to be an experimental study that never came to an end, the characters in the novel build up their own science experiments by acting a way that affected one another. Listening to the presentation I learned that science is part of our daily life and we do not realize it. For example, language is something that we use everyday to community and discuss something. In middle march Eliot works within a scientific theory to do several assumptions as vital tools to really look at things closely, whether it is an action or a tone of voice. Something that I learned when reading the book and listening to the presentation is that Eliot is someone who states things that she feels. Question to Erin Hayes: Lydgate accomplished many things but at the end in the epilogue we find out he never really accomplishes what he had wanted to accomplish just like Casaubon who doesn’t finish his research in his book “The Key to All Mythology”, so would you say that Eliot’s experiment on Middlemarch has failed because the characters themselves have failed? Being able to hear from college students was an experience that many high school students don’t have. It was very interesting to find that the novel has very different views and all these college students were able to analyze and create arguments based on just one novel. A few of the arguments made were middlemarch as one big lab report, the characters using religion to justify their actions, and the sexuality of Mr. Bulstrode and Mr. Raffles just to name a few. I really enjoyed my mentor’s paper “Paradigm and Shifts and Science: Redefining the Nature of Lydgate’s Plot”, Erin Hayes, because she mentioned Middlemarch as being one big experiment along with the characters, even though the novel is literature, the novel is seen as science. Erin argues that Eliot can study everyone’s interests through Lydgate because he is after all a Doctor. Through Lydgate Eliot is able to frame the experiments for the novel. Erin focused on the pier-glass passage and mentioned that it is about human existence and that interactions with humans are not random, that our perception of events is what is creating an arrangement in our life. During the UCLA senior socratic seminar of the novel middlemarch , what Lacey Muckle spoke about “James Chettam and Masochistic guilt. Lacey mentioned how guilt both defines the masochistic pleasure which caught my attention as I gained knowledge on the character Sir James. Something that really caught my attention was when she talked about how Dorothea is a widow and that’s how everyone else sees her except for one person. Sir James say “that it is a shame she is not a queen”. This makes me the reader feel that Sir James has a powerful love for Dorothea. In a way in show some type of guilt to the reader because Dorothea doesn’t consider herself more than just an ordinary women living her life. Another thing that caught my attention was what Paige dudek talk about. She talked about “to hear with eyes”. She mentioned how the main focuses is your senses to hear , touch or see. She relates this to the middlemarch characters, especially Dorothea since she is the type of person who puts herself in others people shoes to see how they do things. 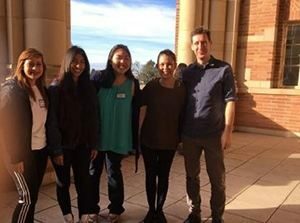 I would like to thank the UCLA Mentors for having us on Monday November 28 for their Middlemarch conference. During the UCLA conference the speech that caught my attention was the “Sexuality and the Dual Representation of Erotics”. The report is about the possible sexual relationship between Bulstrode and Raffles in the past. It is confusing because we never thought of them like that. We thought that it was only Bulstrode knowing where his wife daughter was at but now there can be a possibility that his past can be connected with raffles. Now Bulstrode is afraid that it may come out and he is being blamed for raffles death. Which many of the community believe is the truth. Another speaker that caught my attention was Ashley Hope, in how she said that statues are a symbol of memory of love.Her speech was so lovely and nice, we really appreciate all the information we get from others. One of the presentations that stood out to me the most was Ashley Hope’s “Turn to Stone: The Romance of Eternal Retrospect”. She made connections between the relationship that Dorothea and Will Ladislaw led throughout the book. Ashley quoted Dorothea when she said “I will never forget you” and made a connection to marble statues as a symbol of remembrance. Through this quote I was able to analyze Dorthea a little more as a character, Ashley explained to us that Dorothea and Will’s relationship was not taken place with events in the present but in the past. Dorothea believes that is the last moment she will see Will and creates her own picture. She keeps images (statue) that she can refer back to, such as things she has encountered with Will Ladislaw. I would like to thank the UCLA mentors for their presentations on Middlemarch and for showing us different ways we can see this book. I really enjoyed Ashley’s presentation on Rome and how it’s a connection to the past since it is rooted with memory. I thought her presentation was very interesting, for instance she mentioned a quote from the novel that described Dorothea slowly becoming a statue and Ashley connects this quote to the statues in museums in Rome. There was even another quote that compared Dorothea to the statue called “reclining Ariadne” in their beauty and posture. One thing I gained from this conference was how each character takes role in Middlemarch through various locations, themes, and the significance towards the character traits that are being revealed throughout the whole novel. For example, I really liked the way Ashley presented on “Turn to Stone:The Romance of Eternal Retrospect.” It truly helped me gained a brighter knowledge towards the romance of Dorothea’s and Will’s. She gave a strong analysis on the way Dorothea and Will romance is structured in the past. The Rome city symbolizes their strange romance to which Rome is a city of memory. Every moment of their relationship becomes back in the beginning. Ashley mentioned how objects such as the red rose, or the marble statues, is the way Dorothea sees the future already elapsed, and how she brings the past. Rome is Dorothea’s history in this case. She shifts the focus to the present to the past. A word that stood out for me during the presentation was “Associationism” to which is the past structures of the understanding of the present. Another thing that helped me gained a greater insight on Dorothea’s character was the presentation on “Motivation for Action:The Historicity of Dorothea’s Consciousness” by Emily Chen. I like the way she mentioned Dorothea’s role throughout the whole novel. She includes that Dorothea’s thinks about other’s thinking- the way she seeing herself in connection. She mention that Dorothea way of thinking is more valuable than science. In my paper, I plan to write about the strange romance of Dorothea and Wills on how it is structured in the past, and how every moment becomes back in the beginning. One of my favorite presentation was Paige Dudek, “To Hear With Eyes”. I liked how she pointed out that we all grasp concepts as well as interpret texts in different ways. I enjoyed how she talked about her experience with working with the children and how she was able to observe them and how they begin to read. She tied it back to how people begin to develop these skills as they begin to grow older. I found myself relating to her presentation when she mentioned that some individuals needs to read a text out loud in order to fully understand them. In order me to grasp a text, I have to first read it to myself and to let it make more sense, I read it out loud. She talked about the relationship between auditory (speaking and listening) vs. visual senses. I liked how Paige was able to tie this idea back into the novel of Middlemarch. She compared one of the passages to this which was one of Dorotheas. In general, understanding comprehension is essential when it comes to Middlemarch. We have Dorothea on the side trying to learn new things and become educated by which she marries Mr. Casaubon at the beginning who is a well-educated man. Her title itself says a lot about the characters in Middlemarch because actions speak louder than words. One must be observant in order to grasp onto events happening around them as well as to others. I found the talk on sexuality of Bulstrode and Raffles interesting because it was an idea that I had not yet crossed my mind. The theory that Bulstrode and Raffles had some sort of sexual relationship before makes some circumstances in the book more clear. There is the question of whether or not Bulstrode killed Raffles. If there was a sexual relationship between those two, it would make a lot of sense as to why Bulstrode prayed for the death of Raffles. Bulstrode was this religious person who had power, and the idea of being a homosexual would have ruined his reputation, which eventually was ruined regardless. The idea that Bulstrode and Raffles were involved in each other’s lives sexually would make a lot of sense as to why there relationship turned out so bad and why Bulstrode chose to keep his life so hidden from the rest of the people in MIddlemarch. I was part of the UCLA Mentors and I would like to thank all of the mentors for presenting to all of us their first part of their paper. From first glance of the titles of the presentation, some of the titles I did not know what was going to be their claim or how it had relevance to the novel middlemarch, but after the presentations I fully understood their argument and knew what they were suggesting. Being in that environment in a college setting I got a taste of what it is like to be a college student, as I really got to see the thinking of students in higher education. I found it interesting how well the students were able on elaborate on a single quote and how well they would articulate on each other their claims. In addition, although student mentioned that their presentation was just an outline, I noticed the they all went in depth to their argument, and it seemed as a compete paper. My mentor was Lacey Muckle. This experience of having a mentor was truly a learning experience. through the emails, and the presentation that she gave I recognized that we shared similar thought about certain characters. Lacey was discussing “James Chettam and Masochistic Guilt”. I found it inters=esting how she suggested that he wanted an authority figure to help him with reason, and how he “wants someone of power” to have discussions. The believed that Dorothea in Chettam’s eyes was the best character for this. She also emphasized how Chettam would like Dorothea to make decisions for him, and how he felt encouraged by Dorothea. She mentioned that “starch is like tradition” I was was wondering what exactly did she mean by this, but overall I enjoyed all of the presentations because the all challenged me to see the book in a different perspective. *Commented out loud* At the UCLA conference, I connected the idea in between Dorothea’s consciousness and the pier glass passage. prior to this conference didn’t realize it until that moment that these two concepts and passages were deeply connected. Putting ourselves in each others shoes is the only way to attain true knowledge. Although our inferences may be wrong, it’s the idea of thinking of others’ feelings that allow us to grow as individuals and obtain knowledge. Although there were many amazing papers to chose from my two favorite were “Motivation for Action..” and “The Religious checking and Conscience..” Chris’ Religious checking paper highlighted the ironic use of religion through each character. We see that many Characters in Middle march use religion to either condemn or qualify certain actions. Dorothea uses religion to justify her appreciation of a materialistic object, jewels; she uses region as a means to justify her actions. We see this reoccurring pattern in Celia and Mr.Bulstrode; they both use religion to justify their own wrong doings. Chen’s paper on Dorothea’s consciousness talked about Eliot’s over arching message through out the entire book. Eliot advocates for the understanding of other’s thoughts and actions and encourages the reader, through characters like Dorothea, to put themselves in others’ shoes. THis is important because even if our guess is inaccurate, just the act of being aware of others thought, feelings, and motivations are enough to give us knowledge. After attending the senior seminar class conference my knowledge on Middlemarch was enhanced due to all the new perspectives I was exposed to. A presentation that most caught my attention was Emily Chen’s, “Motivation for Action: The Historicity of Dorothea’s Consciousness” because it gave us insight on Dorothea’s way of thinking. Emily started by stating that Dorothea is always thinking about others’ thinking then she proceeded to give evidence. She quoted Celia, “you always see what nobody else sees.” and that caused me to think of Dorothea as sympathetic. She also argues that the thought of thinking about others causes Dorothea’s actions, she backed this up by giving the example of Dorothea’s interaction with Rosamond. I feel that another good point she should have brought up was her interaction with Lydgate. Her consciousness caused her to believe in him and caused her actions of going to speak with him. This presentation left me with the question: Is Eliot trying to make the readers have the same consciousness as Dorothea? I believe she is because we are constantly hearing the thoughts of different characters and this makes us have a certain thought about them. I would like to thank the students from UCLA for presenting their outlines to us. After the conference I gain some more knowledge about Dorothea and Will in Ashley Hope’s presentation. I found it interesting that she gathered information from a place. she exceeded to look beyond the emotions and more into the detailed locations. She explained that Will and Dorothea’s love was structured in the past and she connected their love with the symbolization of the place they first interacted well, which was rome. My question is: Was Eliot purposely connecting Will and Dorothea to Rome? and can or how would rome connect to their future? I also liked Paige Dudek’s presentation of ” hearing with the eyes” because it allowed me to relate yet think about what the author would except me to see. I just found it very interesting and mind opening.